We’ll be taking up regular monitoring of this play as part of our initiative to keep a close eye on the marijuana market, which just increased in size by a significant margin with the elections earlier this month. That will include keeping our ears to the tracks as we wait for further updates on its plans. Itau Unibanco Holdings S.A. ITUB - In addition to reversing off of a recent relative bottom, ITUB is currently showing us a set of favorable-looking circumstances on the chart, as we’ve pointed out on the included snapshot. We’re going to be tagging a couple of moderate to long-term contracts for this play, namely the ITUB 01/20 and 03/17 $11 Calls. Tiffany & Co. TIF – Tiffany’s is also on our radar on the heels of its premarket earnings release which showed increases sales and revenues. We want to formulate a short-term idea for the TIF chain, as we’ve done quite successfully in the past. Our focus here is going to be the TIF Weekly $80-83 Calls for possible daytrades and/or intraweek swing trades. 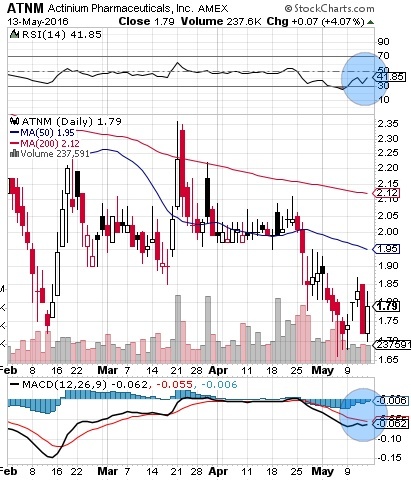 We want to start things off this morning by taking a look at ATNM, for a couple of reasons. First, from a technical standpoint, the chart appears to be coming off of a relative bottom, and a number of indicators suggest that a sizable upswing could occur in coming sessions. Those include a MACD and Histogram that look to be gearing up for a possible cross into bullish territory. Each of the past two times that occurred, the stock saw an appreciable move to the upside. The RSI also looks to be coming off of being oversold- we’ll be looking for a break of that 50-line, and the registering of higher lows and higher highs as ATNM attempts to establish a continued trend off of its recent lows. The other factor that is indirectly drawing us to ATNM is the fact that it operates in the Pharma sector, which is sure to be at the forefront of the news with a couple of huge buyouts. Pfizer has bought Anacor (ANAC) and Luminex bought Nanosphere (NSPH). Whenever we see groundbreaking events happening in biopharma, there tends to be a rise in overall activity for the industry. After an impressive run-up on the chart which lasted from January to April, DDD has taken a pretty substantial pounding in the month of May. We released CSOC as a momentum alert on Nov. 7th. Since that time, we caught a low at .054, meaning today’s high of .09 represents a 66% gain in just four days’ time. We promise, we don’t have the power to see the future, it just seems that way sometimes! We first alerted MILV at .055, followed by a dip to .047, subsequently hitting a high of .142. That’s a total possible gain of 202% during a process which took about two weeks. At present, our alert of CSOC is only about four days old, thus the next week and a half will tell the story of how close CSOC can come to MILV’s accomplishment. We are seldom late to the party, and in the case of PROT, it appears we are a bit early. A reader pick, PROT, has the look of a stock that could rock at any moment. At the moment, things are pretty quiet, but with this technically sound chart, any small amount of buying pressure could kick into motion one heck of a run. CSOC traded just as we predicted in yesterday’s report. There was a small premarket gap up from .071 to .072, followed by a dip to .0623 followed by a close at .069 for an 11% intraday gain. We are not getting impatient with CSOC, as sometimes it takes several days for many of our plays to develop as in the case of MILV. BIRMINGHAM, England, Nov 08, 2011 (BUSINESS WIRE) — Caduceus Software Systems Corp. (OTCBB: CSOC) – (The Company) is pleased to announce that it will be offering a 30-day Free trial of the Caduceus MMS Software System to 1,000 specially chosen customers in the medical community of the UK. These customers will have the option of purchasing the fully licensed version of the software after the completion of the complimentary 30-day trial. Using this newly proposed marketing strategy will prove very beneficial to Caduceus Software Systems (CSOC). The goals CSOC plans to achieve using this strategy include a complete marketing survey outlining retention and licensing statistics. MILV was trading at .055 when we introduced it to our our readers as a momentum play. Following the alert, it hit a high of .0739 (+34%), before dipping back to .047. We continued to cover the play, and have now witnessed a new high as the stock traded on up to .142 yesterday! That’s an added 202% percent on top of the 34% on the first swing, bringing our total gains for this stock to 236% in just under two weeks. Very impressive. EXTO has undergone a consolidation after its run from .004 to .0082, now resting at a base of .006. The stock has shown us its ability to rattle off explosive gains, and quite rapidly at that, so one must keep a watchful eye to catch the next wave. We will of course monitoring and reporting its status to you as always. CSOC was a good momentum call for us Monday midday. Following our call just before noon, .0625 to .0735 for a quick 18% gain. We are going to be looking for similar trading activity today, starting with a possible premarket gap-up this morning. We will then look for a subsequent dip, and the opportunity to time the resultant bottom. DGHG hit a new high of 1.29 on Monday, something that we had been calling for following the company’s uplisting to the OTCBB. We feel that there is room for the stock to run further, with the RSI currently in the Power Zone. 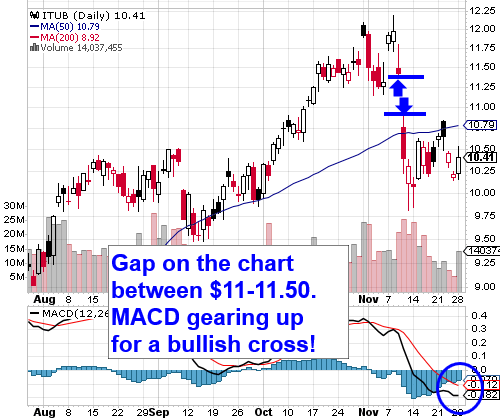 This could be another play primed for a morning gap-up. The open could come at 1.30 or higher. We have been on DGHG since late September and have seen gains of over 80% as the stock ran from .71 to the current price.